As a student at Western State Colorado University, Chris participated in the Wilderness Based Orientation and Wilderness Pursuits programs. The Foundation has been supporting these programs since 2009. The following are thank you notes from student participants. Thank you for assisting in allowing me to kayak around the mesa. It was an incredible experience that I will never forget. It allowed me to meet some pretty amazing people I otherwise wouldn’t have engaged with. Thank you so much for the help to have the chance to go on a WBO trip. It really was a once in a lifetime experience! I had so much fun on WBO Whitewater kayaking. 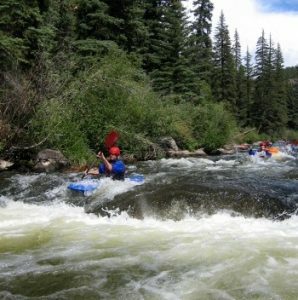 The four days I spent out on the river and in the mountains were amazing. I made some great friends who I can’t wait to spend the next four years with. I really appreciate the help and I’m so glad I got to go. Thank you so much for granting me the WBO scholarship. It was extremely helpful in providing me with an exciting and knowledgeable experience. The scholarship also gave me the ability to better pay off my tuition. Thank yo so much again. The WBO was one of the greatest experiences I’ve ever had. Thank you for your support. It goes a long way. Thanks again. Thank you so much for giving me an extra push in order to pay for WBO. The experience was so rewarding in so many ways. I not only learned how to whitewater kayak, I met some great friends I hope to keep forever. I loved being with people that had the same interests as myself. Thank you again for giving me some money for the 2017 WBO trips. The trip was amazing. I learned many new skills and was challenged in many different ways. Thank you so much for the scholarship! Thank you for helping provide a awesome experience and great intro to life at Western. I was able to make new relationships and learn a lot about myself through challenging situations and the value of risk taking. I had a ton of fun whitewater rafting in Utah. Thank you so much for providing me with such an amazing opportunity! I had so much fun on the WBO trip and am so appreciate of your kindness! My name is sAra, and I would really like to thank you for supporting me. Your donation helped me attend the whitewater kayaking trip and I had some amazing experiences. I plan on continuing to learn more about kayaking as I start my college career. Mountaineering was super fun and I loved it! This entry was posted in Funded Projects, Thank Yous. Bookmark the permalink.